Dr. David Khandabi | Smile Angels of Beverly Hills - Bruce Vafa DDS. Dr. David Khandabi is a board certified Anesthesiologist, who earned his medical degree from the UCLA School of Medicine. He has been awarded a certificate to practice Anesthesiology after completing a four-year residency training in Anesthesiology at the USC School of Medicine. Prior to medical training, he completed his undergraduate work with a bachelor’s degree in neuroscience at the University of California Los Angeles. 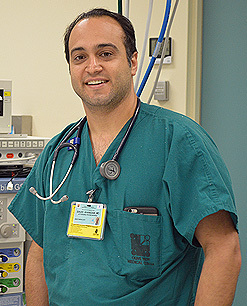 Currently, he is an Assistant Clinical Professor of Anesthesiology at the UCLA school of Medicine where he enjoys teaching both medical students and training resident Anesthesiologists. He holds certificates in both Advanced Cardiac Life Support and Pediatric Advanced Life Support. Dr. Khandabi has a special interest in office-based Anesthesia practice and is particularly adept in bringing hospital grade Anesthesia services to an office setting. As such he has been awarded with both a General Anesthesia and Dental Anesthesia permit. These permits allow him to bring to life his unique Anesthesia skills to an office setting such as the one found in a dental office.